The Epson Home Cinema LS100 Ultra-Short Throw Laser Display has been announced today at the CEDIA tradeshow in San Diego, CA. This consumer friendly, easy to install projector sits on a shelf or pedestal directly below the screen and puts up a dramatic ten foot diagonal (120") picture in your family room at a tiny fraction of the cost of a 120" flat panel. The purpose of the LS100 is to provide very large screen home entertainment in an ambient light setting at a fraction of the cost of a flat panel anywhere near its size. Of course you can always opt for a 70" flat panel, but that is 1/3 the square footage in total image size compared to the 10-foot diagonal image the LS100 can produce, so it does not give you the same dramatic big screen experience. The LS100 is a laser driven projector that outputs 4000 lumens with a high dynamic contrast rated at 2,500,000:1. The light engine is built around three 3LCD Full HD 1920x1200 resolution chips. The laser light source is expected to last 20,000 hours. The Home Cinema LS100 also lets you stream Full HD content from a range of devices includingcable/satellite boxes, gaming consoles and streaming devices like Amazon Fire™TV, Apple TV®, Chromecast™and Roku®. 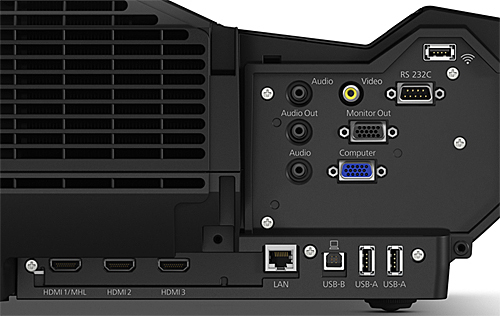 Three HDMI ports keep you well connected to a variety of sources. As with a number of the latest home theater projectors, it does not have 3D, so if 3D is a key thing for you, you may have to look elsewhere. You can project an image from your LS100 onto a bare neutral white wall if you wish, assuming the wall is perfectly smooth and blemish free. But for the most dramatic and sparkling results, you will want to choose a screen to go with it. The type of screen you will want depends on whether you are setting up in a dark theater space or in a multi-purpose entertainment room with ambient light. 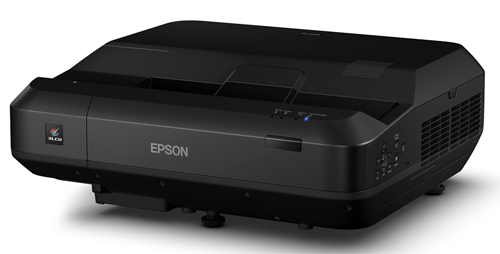 Since the Epson LS100 is designed to be used in ambient light, let's discuss this option first. 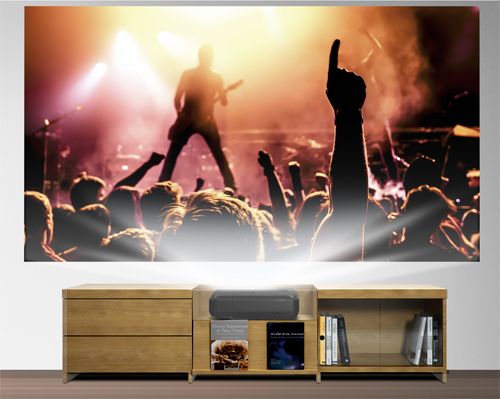 When setting up for ambient light viewing, you will want to use an Ambient Light Rejection (ALR) screen that is specifically engineered for use with Ultra Short Throw (UST) projectors. Most ALR screens do NOT work with UST projectors for the simple reason that they are designed to reject light that is not projected directly onto them from a perpendicular angle. However, there are some screens that will reject light coming from above or the sides but not from the bottom where the light from a UST projector is coming from. These are noted below. Also, keep in mind that you will need a perfectly flat screen. 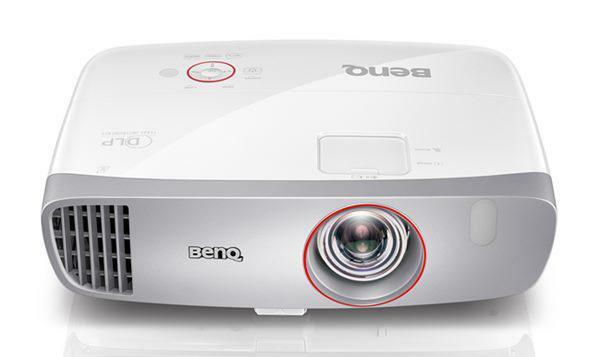 If your screen surface is not entirely flat, the unevenness will be particularly obvious and distracting with an ultra-short throw projector. That means you need either a fixed frame screen or a very high quality rigidly tensioned screen that can be suspended without any curves or waves. ViewSonic BCP120: The ViewSonic BrilliantColorPanel 120 is the least expensive 120" diagonal ALR screen designed for use with UST projectors that we know of at the moment. It is easy to assemble, and it can be ordered on Amazon along with the Epson LS100. At this writing it is priced at around $1,700. If a 120" screen is too big for your space, ViewSonic also offers this screen in 100" diagonal. Here is a video illustrating the assembly of the ViewSonic BCP120. Elite AEON CLR 100: Elite makes dozens of screens for a variety of purposes. The AEON CLR (which stands for "Ceiling Light Rejecting") is designed specifically to work with UST projectors. It is relatively easy to assemble also. Unfortunately it does not come in a 120" size. With this product you are limited to either 100" or 90". However, for many folks 120" is too big. The good news is that the 100" version only costs about $1000, so it is the least expensive option. Be careful ordering on Amazon, as Elite has so many screens listed that it is easy to get confused between the AEON CLR and others that are not both ALR and designed for UST projectors. Here is a video illustrating the assembly of the Elite AEON CLR screen. There are several more expensive screens if you have a bigger budget and want to check them out. The Da-lite Parallax with UST surface sells for about $4,000 in 120" diagonal size. The DNP SuperNova STW is available in a 100" and 120" for about $2,600 and $3,800 respectively. Moving into the premium class category, there is the Screen Innovations 5 Series Zero Edge - Short Throw that can be acquired in 120" for $5995. And there is also the newly released Elite DarkStar eFinity UST (EF120HUST-DS), which lists at $6599 in 120" size. The bottom line is you can spend whatever you want on a specialized ALR / UST screen. We have not reviewed the screens above for their efficiency with UST projectors. Nor do we have first hand experience assembling them, so cannot make specific recommendations regarding an ideal match with the Epson LS100. Now ... after all that discussion about ALR and UST ... IF you are setting up the Epson LS100 in a dark viewing space or more traditional theater room, you do not need the ALR / UST screen design at all. In this case any white or gray screen will work -- again, as long as it is perfectly flat. Cheap pulldowns or pop-ups will not work, as a flat surface is mandatory for all UST projectors. The Epson LS100 is an exciting new development in Epson's home video projector line. Since it can be used either in a dark theater or in living rooms or entertainment room environments, it expands the potential customer base considerably. Since ceiling mounting is not required, it will have a lot of appeal to a much wider cross section of the consumer audience that wants much larger and more dramatic big screen pictures than you can get with flat panels, but who also want it as easy as possible to install. No 4k shifting technology on this? Jacob ... no 4K pixel shifting, just native 1080p panels displaying a compressed 4K signal. However, having seen it, it is remarkable how close to 4K it looks when you've got a good 4K signal. Scarlett's hair in the Lucy close ups was razor sharp in detail. My first thought was, "why bother with pixel shifting if you can get that much detail without it?" *Does this support HDR? is it compatible with color ranges beyond rec709? I ask because some games can be played 1080p with HDR. *Contrast and black level - are they are par or close to LS10500? how did the dynamic lamp perform when you saw it? is it better than other short throw lasers such as the viewsonic LS models and non laser ones like PX800? *Does this have Epsons detail enhancment and motion control systems? what kind of lens does this half? as good as the ones in 5400UB? *lastly - i would encourage you to check out the Darbee Vision 5000 module - the Darbee vision in optoma's is a big hit but this module enables all projectors to benefit from the video processing. In fact, a review would be awesome with several editor's choice projectors when used with the processing. Zee, the full specs on this product have not been released, so we can't say for sure what it has yet. We don't think it has HDR. The claim of 2,500,000:1 contrast is interesting, but we have not tested or evaluated it in our own space so cannot comment on it. This is a preliminary announcement. We will review it as soon as we can get a sample, which should be shortly. Why do they specify up to 120 inches? 4000 lumens should be able to support much larger screens. My 3500 fills up a 150 inch ALR screen nicely even in eco mode with ambient light at only 2500 lumen. Thanks for this write up, very good content and advice. Two questions: For 120" what is the throw distance going to be approximately? Do we think this will have a horizontal flip so you could place it behind a screen? Or a vertical flip to place on the ceiling? Yuppiemike ... we don't have the exact throw distance info yet. I'm guessing somewhere in the range of 18 inches for a 120" image, but we need to get the precise numbers. Yes, it will invert and reverse so you can either ceiling mount or set up for rear projection. Jeremy -- the 120" limit is due to optical limitations, not lumens. Many UST projectors will not focus with precision beyond 120". Doesn't support HDR input while it does support 4k signal input? It's really pointless that it down-converts 4k signals if it doesn't accept HDR10 or Dolby Vision HDR. A large chunk of 4k content requires HDR as well for well. I certainly hope they add at least HDR10 even if there is no 4ke pixel shift. J.J., I would disagree that it is pointless. The picture with a 4K source is noticeably sharper than it is with a 1080p source, and a lot of users will be quite happy with the fact that can accept and display a 4K signal. Very interesting projector. I have a question about the image size. Can it be less than 120"? I have a Screen Innovatons 92" that I'd want to use. You just move the projector closer to the screen, right? Would it be too bright for such a 'small' screen? Bari ... yes you can do 92" ... it can go as small as 80" if you want. See the review linked at the top of this announcement..